Bullet Shot: Brad DeMartino | The Gettysburgian. Senior Brad DeMartino has had a strong start to his final season pitching for the Gettysburg College baseball team. His first game of the season did not go as he hoped, when he gave up six earned runs on eight hits. However, his following two games have been much stronger, with him only giving up one hit during his most recent outing. 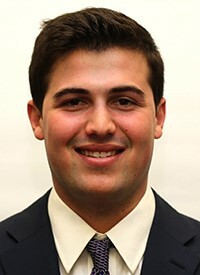 During the team’s trip to Florida during Spring Break, DeMartino started his third game of the year against Marywood. In this game, he not only had his best game of the season but also the best outing of his career. He saw career highs in innings pitched, strikeouts, walks, and hits. DeMartino dished out nine strikeouts and held Marywood to one hit in a seven-inning complete game shutout. The Gettysburg offense helped put the game away for DeMartino with 13 runs. “He’s got great stuff. When he got his fastball, mixing in his breaking stuff and complimenting that with his change and when he’s spotting his pitches correctly, he’s very, very tough,” said Head Coach John Campo. DeMartino also serves as one of the team’s two captains. Coach Campo has been very happy with his leadership on and off the field. “I think he’s been excellent. Being a returning All-Conference player, immediately that puts him into a leadership-type role. We had some great performances from our freshmen guys on our Florida trip,” he said. The Bullets baseball team will look to continue this success on Friday against Gwynedd Mercy at home.